Learn how to share whatever is open on your desktop with other Skype for Business meeting attendees. Note: You cannot share your own desktop or view another person's shared desktop on an Android device. iOS devices can see desktops but cannot share them. See specific information for your device below. The following procedures describe how to perform tasks on a computer running Windows. To see instructions for other devices, see Specific "how to" instructions for your device. Open one or multiple files or applications on your desktop. Make sure no sensitive information is visible--whatever you see, others in the meeting will also see. From the Skype for Business meeting window, click the Present button, then choose Present Desktop. Now anything that you do on your desktop (like moving windows around or making them bigger or smaller), or within apps (like making changes to a Word document) everyone in the meeting will also see in real time. You cannot share or view a desktop with an Android device. If you have an iOS device and are in a conference call or Skype meeting, attendees with Skype for Business on Windows can share their desktop with you, but you cannot share your screen with them. 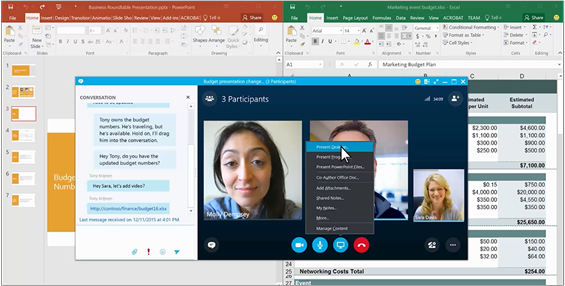 If you have a Windows Phone and are in a conference call or Skype meeting, attendees with Skype for Business on Windows can share their desktop with you, but you cannot share your screen with them. Skype for Business is not available for Mac OS X. If you have multiple monitors, you'll be able to choose the monitor you would like to share with the meeting attendees. Skype for Business will remind you that everyone in the meeting will be able to see everything on that screen. Do a quick check to make sure you're okay with that, then click OK. You'll see a yellow border around the screen, along with presentation controls at the top--that's how you'll know what you're presenting. With Skype for Business, I can share my desktop, PowerPoint presentations, or program files with my team. Molly, Tony, and I have been discussing the budget numbers for our presentation. Tony sent me a link to the Budget spreadsheet in the IM window. I've already opened it on my desktop. I’m going to be switching between two apps—Excel and PowerPoint—so I’ll click the Present button to share my Desktop. MOLLY: “Looks great you two. Nice work.